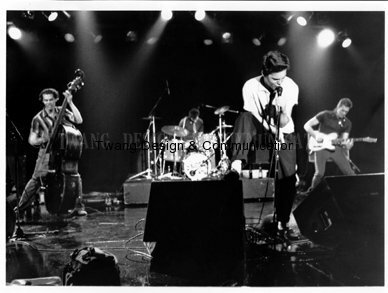 I set up this site to share pics, press, video and audio to give a bit of history of The Nervous Fellas as well as other bands through Mark Twang’s (don’t call me Johnson) eyes of years of playing rockabilly, blues and roots music based out of Vancouver, Canada in the early 80’s and onward. 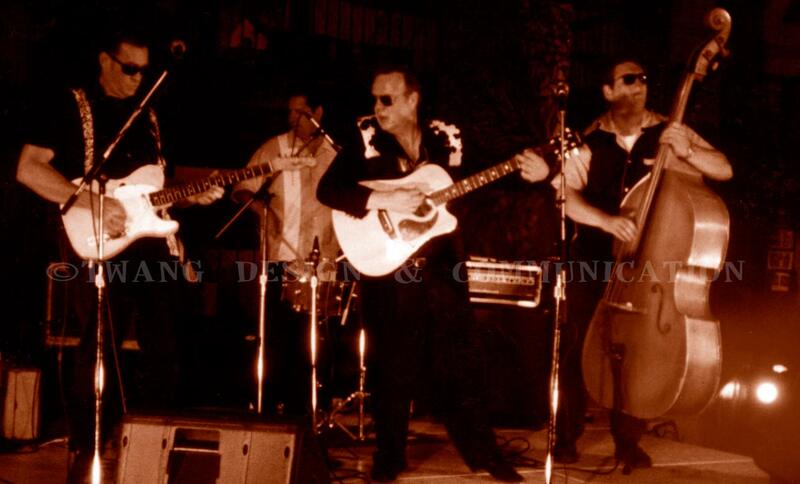 I was lucky to meet and play with and meet some some great players that had the same love of rockabilly, blues and roots music as I did (Jerry Lee Lewis and his band and Paul Burlison of the Johnny Burnette Trio would stand out). 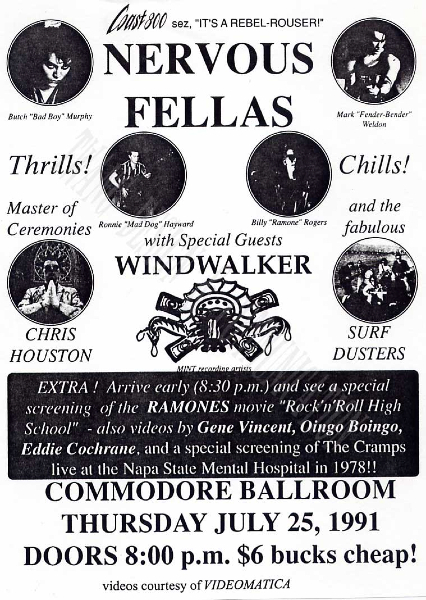 And at the time where you could actually make money as lots of places to play gigs not only in Vancouver but across Canada and venture into our Southern neighbour. Of course not a lot but enough to keep playing and do what we all loved to do, “Play Rockabilly Blues”. 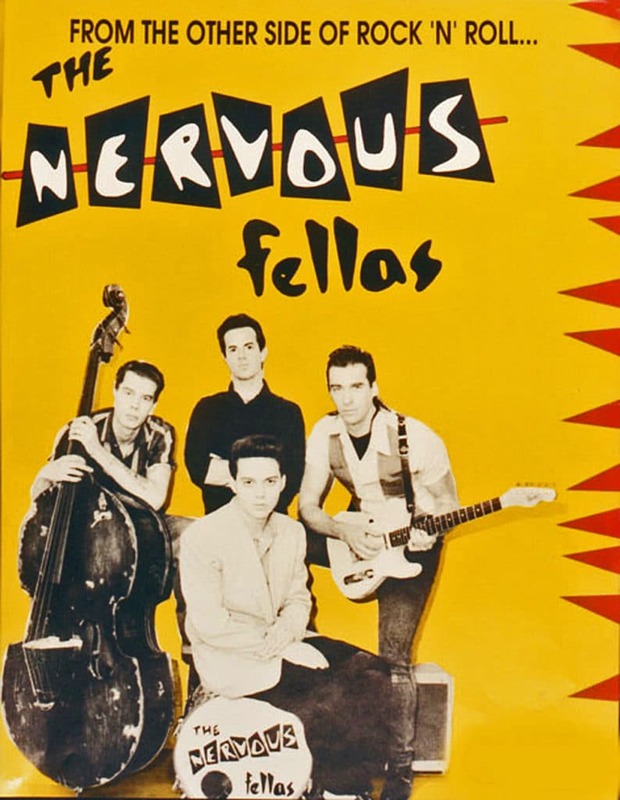 Mark Twang, formerly of neo-rockabilly outfit The Nervous Fellas, reminisces about his time with the band and their eventual demise. The case file lands on the desk. Inside are the details, albeit very sketchy, of the last known whereabouts of Mark Twang (“Don’t call me Johnson”) last seen in action wielding his guitar in rockin’ fashion during the early nineties with equally wild rockabilly outfit, The Nervous Fellas. After months of investigative work, Famous Last Words (FLW) was left scratching its cranium as the search for The Nervous Fellas’ former guitarist was proving a more difficult task than first anticipated, with each and every lead resulting in further disappointment. Such was the feeling of disillusionment beginning to swell in the FLW camp as the search for this character was turning into our very own heart of darkness, where the name and limited information regarding Mark Twang was beginning to resemble that of the mythical Cornel Kurtz in Francis Ford Coppola’s compelling war film Apocalypse Now. With the jungle of research amassed to date throwing up more questions than providing answers regarding this elusive figure, FLW was on the verge of throwing in the towel to signal defeat when, all of a sudden, there was a breakthrough in the case that flashed brighter in the FLW inbox than a ship tanker’s fog light in the middle of the night. Finally, yes finally, the search for Mark Twang had come to an end! After hours spent trawling through various forms of paperwork and speaking with numerous contacts, the final result was relatively easy in the quest to find the former Nervous Fellas’ guitar player, and one that required no effort in the end from our side as Mark Twang sent word that yes, indeed, he was very interested in speaking with this very music paper. Once the initial contact had been made, FLW was expecting to hear that he was living his days of rock ‘n’ roll retirement (The Nervous Fellas are no more) in a suburban setting somewhere in his homeland of Canada. The truth of the matter was that Mark Twang had actually relocated to the warmer surrounds of Thailand; suggesting that the Colonel Kurtz reference was closer in truth than any sense of frivolity on our behalf. Bearing in mind the distance between us, as well as being informed prior to this interview that power cuts are often the norm, FLW was quick to setup a live feed to the remote location where the now legendary “Colonel Kurtz” of The Nervous Fellas was happily residing. Therefore, considering the lengthy wait it has taken to arrive at the position where we now find ourselves, there was only one place to begin this conversation, and that was to establish why The Nervous Fellas decided to end their career when success on the same scale as their close relations the Stray Cats seemed highly attainable. Leading up to this point in time, The Nervous Fellas had witnessed several line-up changes that saw band members coming and going, in addition to returning à la Ronnie Hayward as mentioned by Mark Twang. 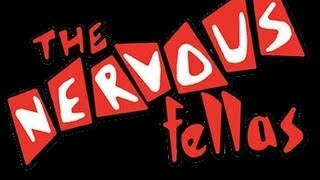 Therefore, the longevity of The Nervous Fellas is something to be acknowledged and applauded considering the various changes in personnel that no doubt would have caused some form of disruption to the band’s momentum on occasions, especially seeing as life began for them back in 1987 with Butch Murphy providing vocals, Ronnie Hayward slappin’ the upright bass, Chris Colt on guitar and Al Black picking up the sticks to provide the backbeat. It wasn’t until 1988 that Mark Twang enlisted with The Nervous Fellas after Chris Colt had departed in 1987 to pastures new. Al Black followed suit during the autumn of 1988 to offer his services to another rockin’ unit by the name of The Last Wild Sons, which saw his replacement, John Decan, fill the vacant seat for a period of time, before the door rotated once more with Billy Rogers replacing Decan. Final mention in relation to the changes in personnel experienced by The Nervous Fellas goes to Pete Turland, who was recommended to the band via a connection in the UK for his natural talents when it came to the doghouse bass and guitar. “When we were at that point , we had already grinded it out,” continues Mark Twang on his response regarding the demise of The Nervous Fellas. “For me personally, this was four years with that band and fifteen years on the road doing gigs. The singer, Butch [Murphy], had also been doing that with his brothers as well, and we just came to the point where we gave it a break, you know, hit a wall and just needed some downtime, so we did that. Ronnie [Hayward] was already in town again and we ended up jamming with him for something to do. Billy [Rogers] was from New York and he’d married a girl from Toronto, and Ronnie had met him in Toronto and played over there with him and he was known as Rockabilly Rogers. “We were actually going to do a gig opening up for Dwight Yoakam, but those guys [two of The Nervous Fellas] just wanted to drink beer and do that kind of stuff, so they split off from that later and started their own band, and that’s really why we spilt up because it just faded out in a sense. I didn’t really care by that point because it had been grinded out for so long. We kept going up the ladder in a sense, where we got better gigs and more pay from shows with, for example, George Thorogood. So you end up seeing their level, and that’s the level you’ve really got to reach if you’re going to maintain it on the road all the time. “I did all the business stuff on the road for many years. I would therefore deal with that and see that everybody got paid and signed all contracts and other such things. In terms of Thorogood, and hanging out with his road manager, I saw that they were making about $60,000 a night at that point and they were playing those middle arenas and theatres with good sound and quality. 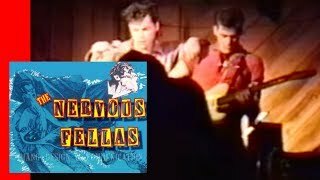 The “grinding it out” reference that the Nervous Fella’s former guitarist uses frequently was definitely the deciding factor when calling time on the Canadian rockabilly’s career. After years of touring with varying degrees of success and failures, the toil of such a journey, not to mention the unpredictable nature of the music business, life for Mark Twang outside the four walls of The Nervous Fellas suddenly seemed far more appealing, especially when faced with the reality of no money and finding yourself upside down in a rusty old tour bucket of a van on an ice bitten road and close to breaking point. Life for The Nervous Fellas really was at an end. “During that last stint of the band, someone wanted us to play a New Year’s [gig],” recollects Mark on that fateful last evening. “We never really travel in the van when there’s too much snow and ice up in the mountains. Anyway, we did this New Year’s gig as these guys really liked us up in Saskatchewan. We did a bunch of songs and it was really fun, but then we had to head back. It was 45 [degrees] below, and we actually stopped because it was so cold. The battery in the van actually dies if you don’t have it all setup [beforehand], and it froze along with the oil as well. So we had to wait to get out of there, and ended up having a late ride home. We also picked up a nail in the tyre when we were at the gas station, and we couldn’t even turn the van off because it was so cold, but we had to keep it going for the heat. At one point on the journey home we flipped the van over after all those years and miles we’d put on it due to hitting ice which, along with a flat tire, pulled us in to the side of six feet of snow. We were sitting there upside down with the engine still running. I said to the guys that I could crawl out of my window as it was the only exit at this point. I crawled out and the rest of the van was all snow as we’d just slid right on the roof. After the demise of The Nervous Fellas, Mark Twang continued performing whether alone or teaming up once more with fellow comrades Rich Hagensen (The Rockin Daddys) and later Pete Turland, who was drafted in as part of The Bloodhounds along with blues musician Harpdog Brown as a favour from Mark due to Pete struggling with work permit issues after moving from the UK. With Mark Twang having moved on in more ways than one since his stint with The Nervous Fellas, and before we attempt to rewind this story to the very beginning in terms of his involvement with the band, it would be worth establishing whether this former rockabilly unit has any plans to get back together in the not too distant future. “I’ve never really talked to anybody about the band reforming, and I’m not getting any younger,” he jests. “Ronnie [Hayward] and Pete [Turland] are still around, and it would be good for that, as I would play with those guys any day. Before I joined the band, I was playing for years before I’d even moved to Vancouver. I’d played with all the different musicians that are around there, and with Ronnie in three or four bands, so by the time you get all through that, you’re already playing, even though you may not be the best player as I can play better now. Furthermore, your energy levels and your whole thing of playing every day, all the time, with the same people, elevates to that where it’s called music. We had some really good shows like that with Pete in the band as well, where the crowd picks up on that and they’re just yelling crazy because it just elevates back where it becomes one, and that’s what music is all about. As the present consumes the life and times of Mark Twang with what sounds like a blissful life in Thailand performing live, it’s the past that FLW is concerned with as we head back in time to the year 1988 and the introduction of Mark Twang to The Nervous Fellas and their brand of rockabilly. “As I mentioned earlier, I didn’t officially join until ’88” replies Mark Twang in relation to his time with The Nervous Fellas. “I did some gigs with them in ’87, but I was busy with other bands and stuff by then. 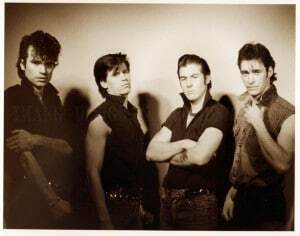 Originally, The Nervous Fellas were called The Kingpins, which was in early ’87 when I did some gigs with them and my band called Trouble Bound. 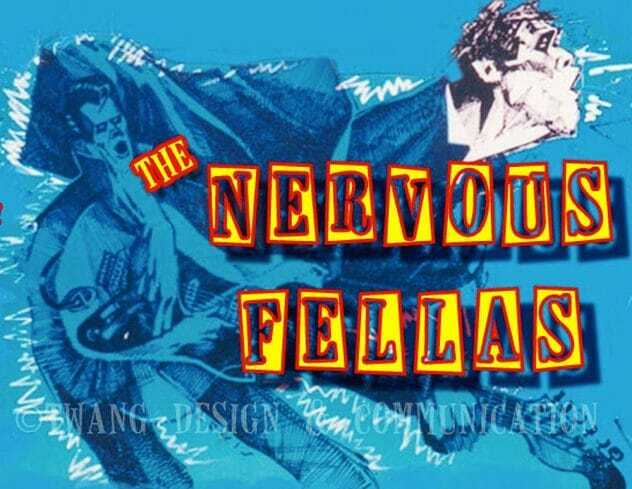 They [Nervous Fellas] ended up changing their name later that year. 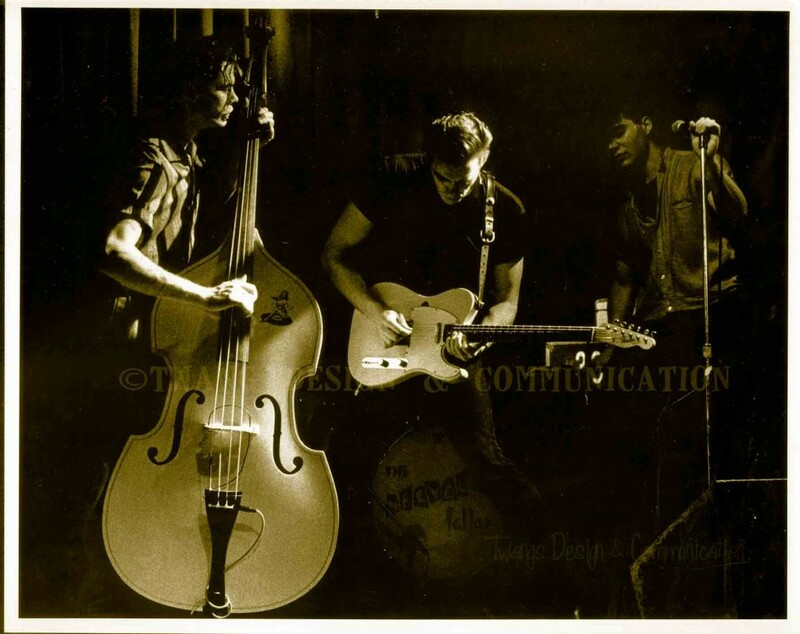 “I have played with Ronnie Hayward (stand-up bass) since 1984 in rockabilly bands in Vancouver. We were both in a band called The Bopsters with Rich Hagensen (later Howard Rix) and Britt Hagarty, who wrote a book on Gene Vincent called, ‘The Day The World Turned Blue’. He [Hagarty] also put together a gig for the book opening and we played that as The Bopsters first gig, and all the rockabilly guys in town came to that gig. I got to know everybody through this, and Butch [Murphy] the singer in The Nervous Fellas was with his band The Rockin’ Edsels at that gig. The drummer and guitar player [Chris Colt and Al Black], who were in the original line up of The Nervous Fellas around that time, were both in The Rockin’ Edsels as well. “In ’86 Ronnie and I did some recording and an original from those sessions, ‘Muddy Waters’, was put on a compilation for Nervous [Records], and that’s how I later got hooked up with Roy Williams on Nervous Records (more of which later, FLW). Also, The Nervous Fellas put a song on that same compilation with Chris Colt on guitar, Butch and Ronnie put that together because they had been around the scene for a bit like me. How did your introduction to the genre of rockabilly come about? “I got in to rockabilly with Robert Gordon and things like that out of New York,” answers Mark with a hint of enthusiasm in his voice and no doubt at the memory of those early Robert Gordon records. “I’m from Hamilton, Ontario, and a lot of that [Robert Gordon et al] was big back then. When I moved to Vancouver I loved Link Wray and all that stuff, which was cool. 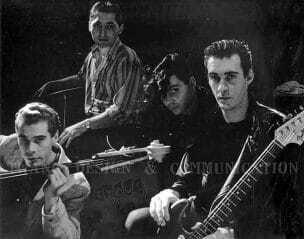 Did you find that the rest of The Nervous Fellas shared your passion for rockabilly? “Butch and Ronnie were both hanging out and they both loved rockabilly and they were two rockabilly guys. 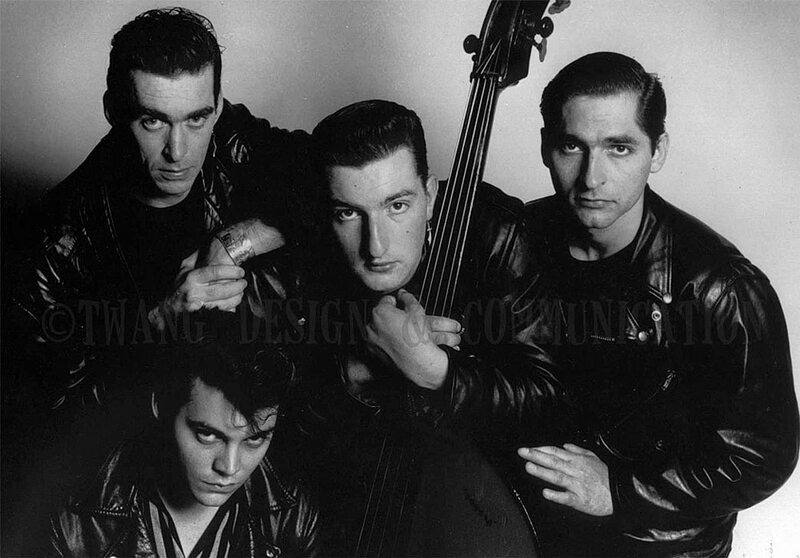 Ronnie never played electric bass as he always played a stand-up bass, and Butch was always into rockabilly as he loved Gene Vincent, for example, and he was into that with his brothers, but to me he was always the dedicated one out of all the guys because he was really into it. 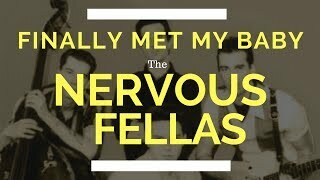 Who was responsible for writing the songs for The Nervous Fellas when you joined the band? 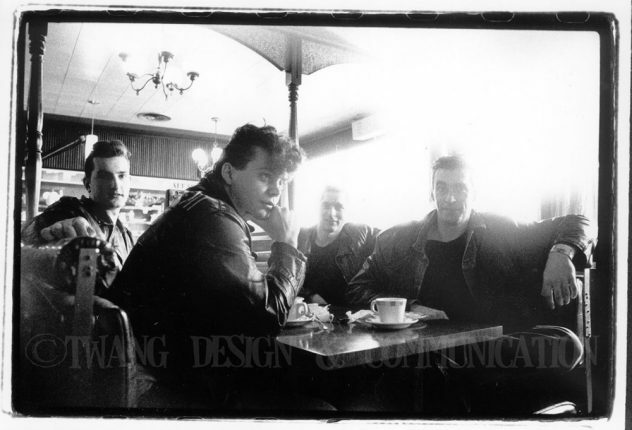 “In the beginning everybody had been writing songs on their own,” says Mark. “So on that first tape, the first six songs we did in June ’88 or something like that as we were going on a road trip to Toronto, we recorded a song each that we wrote and then did two covers on there. How did you pick up on these British bands considering there was no internet back then, and with The Nervous Fellas being based all the way over in Canada? “I used to write letters to Roy [Williams] or make phone calls back in the day,” Mark answers. 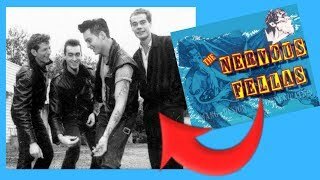 “Also, a band that I was in, The Trouble Bound, prior to joining The Nervous Fellas, a buddy of mine from England was into rockabilly and he’s a great bass player and was in that band that I was in, he knew about Roy and had records from his label, so I got to listen to these records from him. I would also go down to the import shops where I bought the first Stray Cats album, and they were more expensive imports but you could get them. As Mark Twang continues to discuss his years with The Nervous Fellas, he viewed the band’s sound as a combination of rockabilly with strong blues and country influences (depending on which side of the tracks you resided in terms of Canada) intertwining with a flourishing neo-rockabilly scene that had emerged in the UK at this time. “For me personally, when I’m in a band, I always look at it as rockabilly with a blues influence more than a country influence because I come from a blues area, like a blues town,” explains Mark. “I’ve liked country stuff through the years, and most of the guys in Vancouver were more country rockabilly, but also liked the blues influenced rockabilly. When thinking about rockabilly and a country such as Canada, the popularity of this particular genre of music becomes a little cloudy when digging for reference points to rival those of the bigger names Stateside during the ’50s. 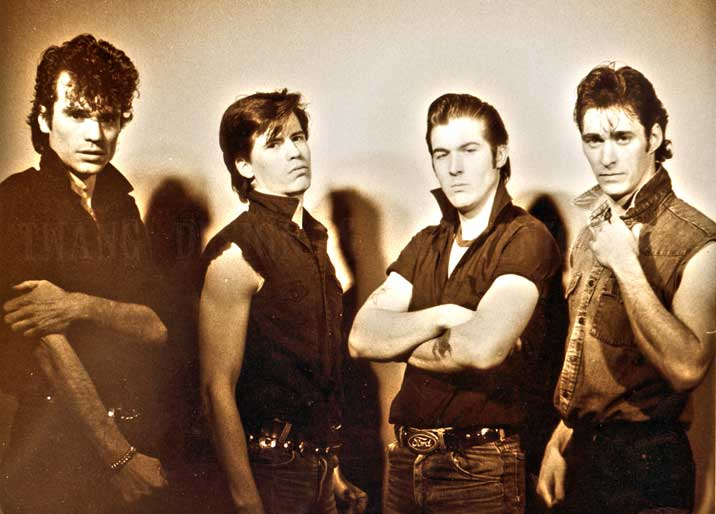 Furthermore, when considering the rebirth of rockabilly music in the UK during the ’70s and ’80s, how exactly were The Nervous Fellas received by Canadian audiences more accustomed to mainstream pop and rock during this particular time in history? “Nobody knew what the f*** rockabilly was really,” answers Mark honestly. 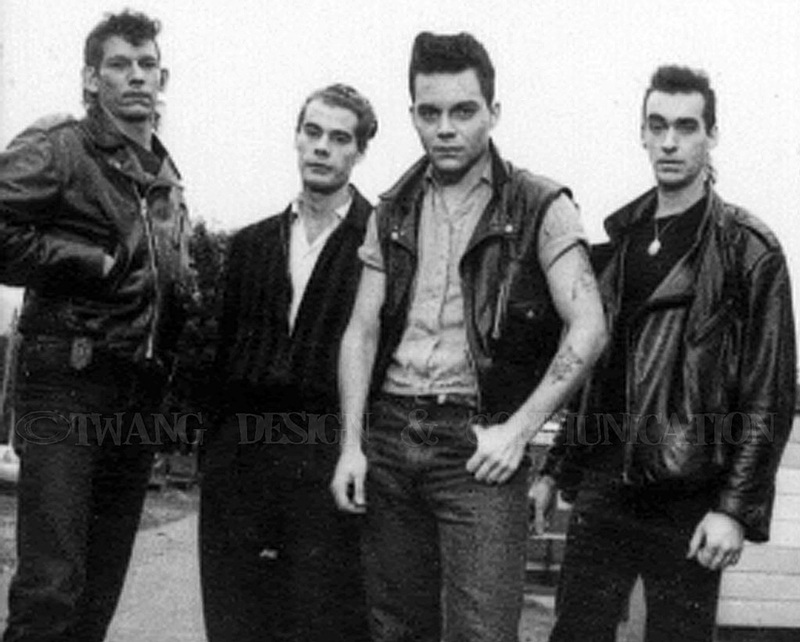 “The main thing we got through the years and still sticks out was, ‘We don’t like rockabilly, but we like you guys’, and that was the same thing we heard all the time because they didn’t understand rockabilly and it was hard for promoters as nobody knew how to promote it. What were those early gigs like in terms of the reception you got if people didn’t know much about rockabilly? “The early gigs with The Blasters or when we opened up for Jerry Lee Lewis (Yes that one folks! FLW) were really cool, in addition to doing our own shows where we’d sell out this place called the Town Pump in Vancouver. Later on, we would sell out small venues with four or five or six nights in a row, and that was also cool. Then there would be other places such as Waterloo or Thunder Bay and then you would backtrack again due to nobody knowing you, but they would like you because they were having fun and appreciated live music. Did you manage to get outside of Canada much in terms of touring? “Later, we went to Washington and Tacoma State so we played quite a bit in that area. When we first went down there, Pearl Jam, Nirvana and Soundgarden were performing in the underground clubs back then, and we would play the same place the next night. There was a lot of punk crossover gigs at this time. When you go back then too, we did a lot of parties and after hours shows. All of us had played stuff like that through the years and knew a few people, so we’d get asked to do those shows. So with nothing to report in terms of live action overseas in Europe, the connection with Britain and the record deal that The Nervous Fellas secured for their debut album becomes even more of a mystery. Therefore, how exactly did four guys residing in Vancouver secure a deal with a UK independent record label? “We gave our manager, Laurie Mercer, the contact information for Roy Williams as he’d already put out a song by my band, Trouble Bound, on a compilation called, ‘American Rockabilly’. In addition to this, when Ronnie [Hayward] left the band, we couldn’t find a bass player, so I phoned Roy in England and that’s how Pete [Turland] got involved with the Nervous Fellas. I said to Roy that we needed a bass player, and he was already interested in doing an album with Ronnie [Hayward] by then, so he said he’d look into it and get back to me. He gave me Pete’s number and I phoned him. Pete was just twenty years old and had performed with Darrel Higham [guitarist, singer], but that was when Pete was younger and they were all about thirteen or fourteen. So Pete had already been playing for a long time by the time he was twenty. Our management company, S. L. Feldman, had enough cash to support us so that I could offer Pete a one year return ticket. He had nothing to lose as we had two months booked solid of gigs playing across Canada back to Ottawa and Toronto, in addition to a lot of smaller places because they had the universities and colleges. 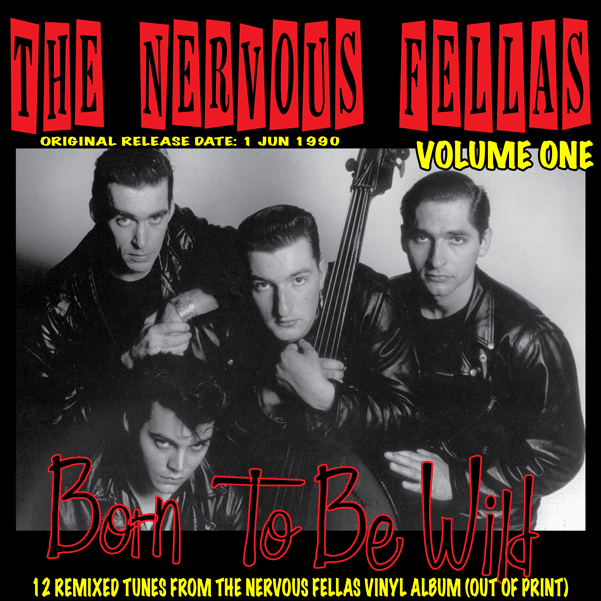 Once the record deal for The Nervous Fellas had been agreed with Roy Williams over in the UK, and the band’s debut album ‘Born To Be Wild’ was underway, further action was taken by their management in an attempt to raise The Nervous Fellas’ profile as Mark Twang explains. Where was your debut album ‘Born To Be Wild’ recorded? “We recorded the album in Vancouver at a studio called Profile Studios with Cecil English. 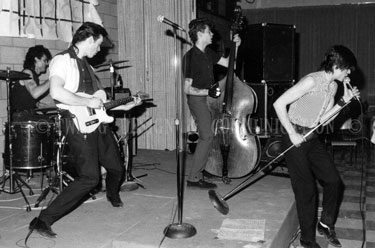 The bands D.O.A and No Means No had also recorded there as well, so he [Cecil English] was used to recording a punk sound but had never recorded rockabilly before. I mixed that first album with him, and I had already mixed the cassette thing we did, but he didn’t really know how to record the stand-up [bass] and stuff. It was all good though, as Cecil was really good at trying different things. We did two albums in there; a North American mix and then a mix for Nervous Records that was more of an English mix as we would call it. The best way to explain the mixing is that it’s heavier, not in the sense of heavy metal, but a heavier sound like more of a ballsy sound I would call it in North America. It sounds as if you have a few songs left over from the album recording sessions? “Basically, we’ve got a lot of songs that are unreleased from those recordings. That album came when Pete [Turland] was in the band, so we were already on the road for quite a while and we had the songs. I had the songs that I’d written when Ronnie was in the band like ‘Moneyed’, ‘Get Out of This Town’ and ‘Don’t Bug Me Baby’. Butch Murphy had some, and Pete brought in his songs. Why were some of the songs discarded by Nervous Records? “He [Roy Williams] picked the more traditional stuff because he had a problem with our sound as we weren’t rockabilly enough for the diehard rockabillies, and we weren’t punk enough for the other guys as we were somewhere in between. He even picked the album cover as he didn’t use the one we sent him. Nervous Records put together their own cover because Roy knows his target audience and what he can sell. Roy’s really smart on that stuff as he’s been in this business for years and he knows what he can sell. So we just recorded tons of stuff and sent it over and he picked which songs he thought would fit well and work for his target audience. Why did you record only the one album, and did you have another album ready to go? “We had another one ready when Ronnie [Hayward] came back,” mentions Mark before adding, “but we kinda disbanded after trying to get stuff [record deal], and we couldn’t get anything. Billy [Rogers] and I had a typewriter and we mailed out to Capitol Records and all different labels including independents after that. It used to cost a lot of money to put things out back then. It wasn’t easy to put an independent record out because you needed some kind of distributing; you needed to press it, you needed all that stuff, so it’s a lot of initial cash flow and that’s why the band never made any money from the record company. Do you think that was down to fashion and trends changing in relation to bands such as the Stray Cats struggling to maintain their previous success? and prior to that I was working a lot because all that was on the radio, not just the Stray Cats but all that roots music was on the radio, so I could get a lot of work at the time. But that was five or six years later, and everything kinda shifts around like it normally does, despite there still being pockets of stuff. As for the A&R guys, they didn’t know what the f*** to do with what we did, nobody knew. Why did Ronnie Hayward end up leaving the band in the first place, considering you had been performing with him for a long time? “When I first joined the band in ’88, we did this opening gig with The Tailgators and Ronnie ended up going to Austin, Texas. They phoned him as their bass player, Keith Ferguson (the Fabulous Thunderbirds) quit and they asked Ronnie if he’d like to join the band, which was in ’89. So Ronnie finally went down there to check it out, but it left us with no bass player. 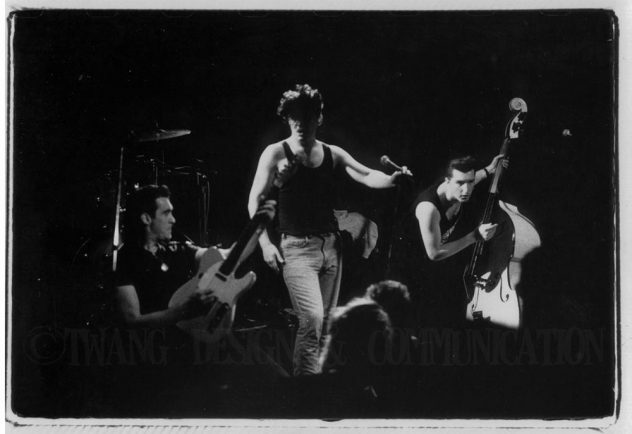 With the changes in personnel as mentioned earlier in relation to The Nervous Fellas and frustrations experienced with record deals and general lack of finances, the band managed to attract the attention of a number of other bands who had made a name for themselves, which resulted in various support slots for The Nervous Fellas with the likes of the Pogues , Jerry Lee Lewis, Joe Ely, The Blasters, George Thorogood, The Beat Farmers, Sleepy LeBeef, The Tragically Hip and more. “We played with the Tragically Hip when Pete [Turland] was in the band, so that was a little later,” begins Mark. “We opened up for them in Saskatchewan at the University, and we played a few nights with them and then hung out with the band as they were really nice guys. They were going up the [career] ladder at that point, but again nobody really knew what to do with us. It was all about radio back then as well, and whether you fitted in or not. The Tragically Hip got played on the rock stations and stuff like that, and we got radio play on university stations and then followed by all the independent radio support. So with the album out, there was a radio station, Vancouver, which played ‘Finally Met My Baby’ and ‘Evil Ways’ and another song that’s not on the album called ‘Someday Soon’. It’s not every week that you receive an opportunity to speak with genuine legends of music whether on a scale of major stardom or those more obscure artists who’ve built something of a cult following. The legend that is Mark Twang and his fellow band mates of The Nervous Fellas certainly fall into the latter category, where the sense of mystique as well as history surrounding this entire rockabilly outfit makes for such a fascinating discovery.